Thanksgiving weekend is the time I always devote to thinking about holiday gifts for the kids in my life. As I have previously confessed, I am a big fan of gifting books. Not just any books, books that I think will match kids’ interests and personalities. This year I have spent a lot of time perusing the aisles of bookstores to familiarize myself with the newest released books. I am compiling some books that I am planning to give this holiday season. First up…. 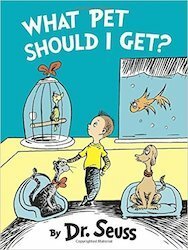 Dr. Seuss’ instant classic What Pet Should I Get? for kids ages 3-7. A young brother and sister go to a local pet store to pick out a new family pet. Choices include the obvious cat and dog, but are quickly followed by some imaginary creatures. This book follows the familiar Seussian rhyme scheme infused with humor. At the end of the story, they leave with a pet, it just remains a mystery to the reader. A great opportunity for young readers to use their imaginations. 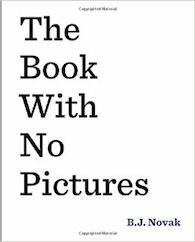 Up next… The Book with No Pictures by B.J. Novak, a hilarious great for readers ages 5-9. 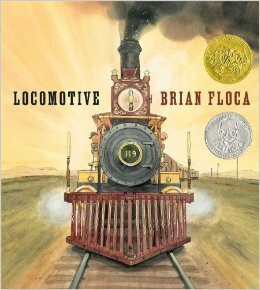 And, finally for our non-fiction enthusiasts, I’d recommend Locomotive by Brian Floca, for readers ages 6-11. This is a visually stunning book about the Transcontinental Railroad. It is detail rich in the descriptive text and beautiful illustrations. The book takes you on a historical journey from east to west, set in the summer of 1869. Stay tuned for more recommendations of books to give! Grandparents can play an important role in a child’s life. My own grandmother was one of the strongest role models in my life. She taught me the importance of kindness and acting with integrity. She was an incredible, loving and independent woman. 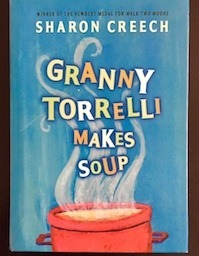 The grandmother in Granny Torrelli Makes Soup, by Sharon Creech, reminded me so much of my own grandmother. Creech brings to life the precious relationship between grandmother and granddaughter so beautifully. The time I spent reading Granny Torrelli allowed me to remember her and to smile. Granny Torrelli Makes Soup (Guided Reading Level: S) is about the friendship between twelve-year-old Rosie and her best friend Bailey. Granny Torrelli serves as the voice of reason and experience throughout the story. Her actions and words are deliberate but subtle. She shares experiences from her own childhood with Rosie to guide her, rather than to tell her what to do. The role of food and cooking throughout the story, also reminded me of visits to my grandmother’s house. In Armenian households, much like Italian ones, food is essential to shared family experiences. Simply replace soup and pasta with dolma and bereg. Granny Torrelli Makes Soup is going to be our first read aloud this year in my 4th grade class. I can’t wait to share this book with my students.